The Comedy Bible: Check Out the Authors' Website, SHECKYmagazine.com! Check Out the Authors' Website, SHECKYmagazine.com! 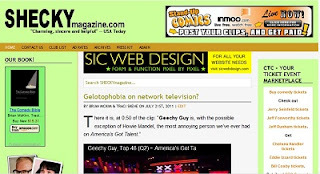 SHECKYmagazine.com, the WWW's most beloved magazine about standup comedy since 1999, has been featured in the Wall Street Journal, USA Today, the Washington Post and on WCBS News Radio and National Public Radio. USA Today called McKim & Skene "charming, sincere and helpful" and the Wall Street Journal said SHECKYmagazine.com "gives comedy fans a rare, behind-the-curtain glimpse into the amount of work, travel and failure that any standup who embarks on a professional career can expect to endure."